Cobbler’s Cottage01584 831238work Self-cateringThe cottage is full of medieval charm and cosiness – it is a typical example of a black and white cottage with beamed walls and ceilings which has been recently renovated and caters for 4 guests. The main entrance into the cottage (via a couple of steps) is into a large sitting room. Furnished in light and airy colours, there are plenty of armchairs and a sofa together with a dining table and chairs. There is a digital TV and internet access. Leaflets and an information booklet are provided, as well as some reference books and maps. The house has gas central heating but there is also a wood burner in the sitting room (a basket of logs is supplied) to sit in front of on those no so balmy days. Up one small step is a hand-made bespoke kitchen, which is well equipped with a fridge/freezer, double oven, electric cooker, microwave, dishwasher and washing machine. It also has lots of lovely French cookware and many other utensils for the keen cook. Through the kitchen and down a couple of steps, is a lovely sunny conservatory, overlooking the garden. It has a very useful large cupboard for coats and boots. There is also a small table for a tête-à-tête breakfast, as well as a sofa and other chairs. Also, outside in a little alleyway, between the parking and the conservatory, is a small shelter – ideal for storing bikes. From the sitting room, original stairs (which are therefore a bit wonky) lead up to a large landing. Here you will find a bookshelf filled with novels and games, as well as a desk. Internet is provided (if unfortunately you do need to do some work) together with a large comfy armchair for peace and quiet! There is a cosy double bedded room and a large twin bedded room as well as a beautifully styled bathroom with bath and shower over. Towels are provided. The cottage is set in an area of outstanding natural beauty with many walks on the doorstep. Modern Pembridge boasts a wealth of cafes, pubs and a restaurant, together with a couple of small village shops to get the necessities, all are within easy walking distance of the cottage. The cottage has off street parking for 2 cars. 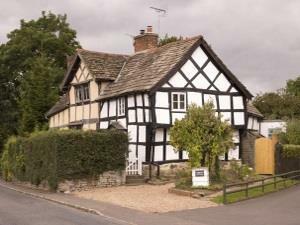 The cottage is full of medieval charm and cosiness – it is a typical example of a black and white cottage with beamed walls and ceilings which has been recently renovated and caters for 4 guests. The main entrance into the cottage (via a couple of steps) is into a large sitting room. Furnished in light and airy colours, there are plenty of armchairs and a sofa together with a dining table and chairs. There is a digital TV and internet access. Leaflets and an information booklet are provided, as well as some reference books and maps. Entering the village of Pembridge on the A44 from Leominster, the cottage is the last but one house on the right. There is a beehive outside with the cottage name on it.